Summary: Just when Kate Lowry thought she had life at elite private school Pemberly Brown figured out, she cracks open a fortune cookie to find a message from her best friend Grace--who's supposed to be dead. Review: If you like books with prep schools, secret societies, or mystery then why aren't you reading this series? No seriously, these books have all three. AND they are done brilliantly so yeah. 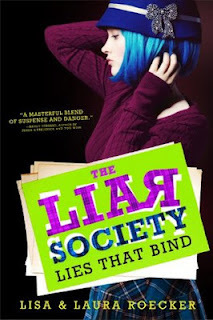 I really liked Liar Society which is the first book in the series so I was excited for this next installment and the Roecker sisters did not let me down! It had been a while since I had read the first book so it took me a few minutes to get back into the book, but once it got going I was immersed yet again. The Lies That Bind is a great title for this book because I, like Kate never knew who to trust, and was surprised by the ending. I had inklings of what might happen but when it really happened I was not expecting what played out. Pemberly Brown looks like such a cool place. I mean secret tunnels and secret societies, yes it gets out of hand, but still so cool. Kate is so awesome. She is tough, loyal, and a little reckless. She is determined to save another girl from the same fate as her friend, even if it was a girl she did not like very much. No matter what the cost, she keeps trying. She also dyes her hair blue. I wish I had the guts to dye my hair blue! Basically if you like, mystery, secret societies or just witty books you should pick up this series!